Intake Valve, 2.050'' x 4.903'' o.a.l. Intake Port Gasket, 1.280'' x 2.090'' w/ 3/8'' radius Fel-Pro 375-1205 - DO NOT PORT MATCH Intake Manifold to Fel-Pro Gasket. The AFR Emissions Legal (versions from 1969-94 with heat riser, CARB EO #D-250-2), 195cc intake port small block Chevy cylinder heads are available in your choice of straight or L98 angle plug versions. 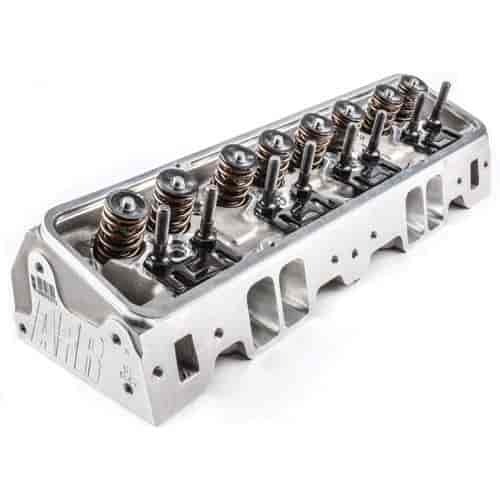 These cylinder heads feature a 65cc or 75cc combustion chamber with a 64cc exhaust port and a 3/4'' thick head deck (ideal for nitrous or blower applications). Standard valves are lightweight 8mm diameter stem, 2.050'' (comp package has 2.080'') intake valve and 1.600'' exhaust with AFR's hardened ductile iron interlocking valve seats. The exceptional flow characteristics, ideal operating range of 2000 rpm to 6500rpm, 23° valve angle, and standard valve spacing make this the perfect street head for 350-400ci engines from 1955-1986. Also available for 1987 to 1995 cast iron head engines with center bolt valve covers and 2 center intake bolts at 72° angle, AFR head p/n 033-1041. No special parts are required. Dual valve cover bolt pattern is standard. Exhaust port and bolt pattern are raised 3/32'' over GM L98 cylinder heads, this rarely affects header or chassis fitment. .
Can I run the Lunati Voodoo Hydraulic Flat Tappet Camshaft and Lifter Kit Chevy Small Block 262-400 Lift: .504&quot; /.525&quot; with heads? Part Number: 638-10120704LK. My concern is springs. These heads are designed to be used with a hydraulic roller camshaft not a flat tappet cam, we would recommend changing the springs or upgrading to a roller cam. What do I need to do to be able to run Lunati 73943 valve springs on the the AFR head 033-1034? or are they compatible withe the supplied retainers? Those springs are compatible and should work with the retainers that come with these cylinder heads.